After months of intense speculation, Apple announced its smartwatch platform at an event in Cupertino, California on Tuesday. It will go on sale in early 2015 starting at $349. The central app on the Apple Watch is the clock, which comes with a few nifty features, like the ability to superimpose your position in the world on a rotating globe. And as expected, the Apple Watch will be able to run apps that display “glances.” Glances are notifications that use subtle haptic vibrations to alert the user, who can’t read them until he or she raises the Apple Watch to his or her face. Apple demoed apps and glances from Twitter as well as a few new in-house apps, like a messaging system that sends emojis and short doodles. Haptic notifications will also be used for turn-by-turn directions on the Apple Watch maps app, letting the user know when to turn left or right. The Apple Watch uses a flexible retina display with a sapphire crystal screen, with rounded edges that look similar to those on the iPhone 6. Like Google’s Android Wear smartwatch platform, Apple Watch will require a paired iPhone, although it will only work with the iPhone 5 and later. The Apple Watch can also be used with Apple Pay. 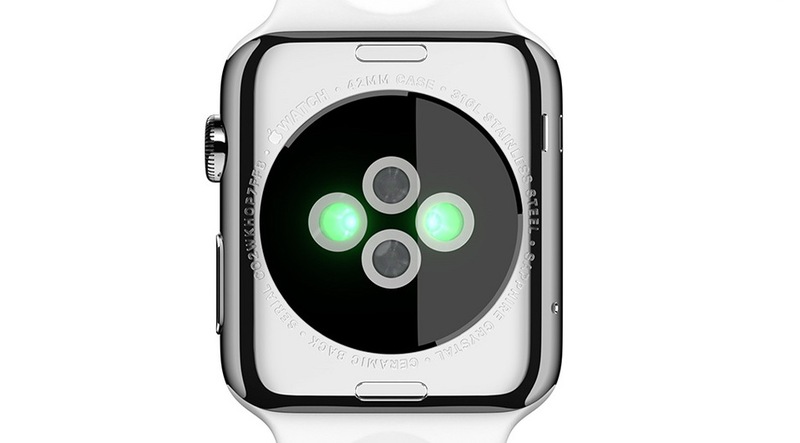 One of the unique hardware elements of the new Apple Watch is four sensors built into the backside of the device. These sensors include infrared and photosensors, which used together with other sensors, like a pedometer, can be used to assess a person’s physical activity. These sensors are used in a new fitness app, which tracks progress over time. The Apple Watch and the associated Workout iOS app measures three aspects of activity: “Move,” “Exercise” and “Stand.” The “Move” metric, which is displayed as a ring, will give users a brief overview of how active they are. The “Exercise” ring will be used to measure brisk physical exertion. And the “Stand” ring will tell you how often you’ve taken a break from sitting. The Workout app supports running, walking and cycling. The Apple Watch will charge wirelessly through a new mechanism that combines Apple’s magnetic MagSafe connector with inductive wireless charging. 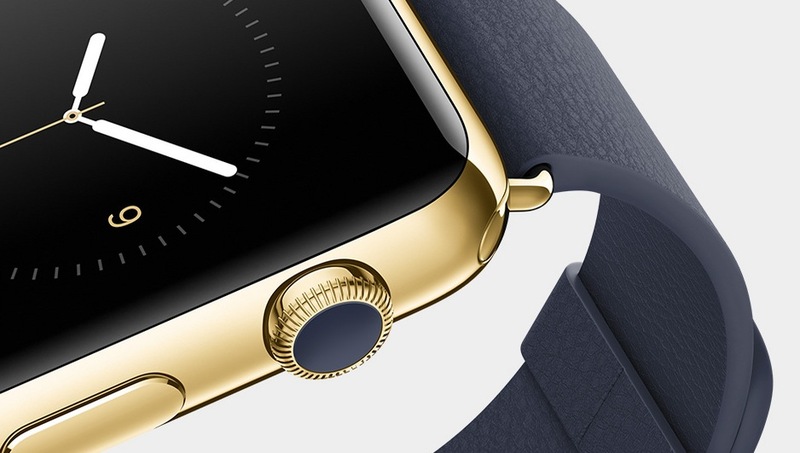 There are a surprising number of customization options for the Apple Watch. Since looks are so important to watches, Apple Watch will come with a variety of different straps that it is calling bands. Apple-made bands will come in three “collections.” The Apple Watch Collection is the default band, but there are also sweat-proof “Sport Collection” bands, and Watch Edition bands that will look more like jewelry, some plated with 18-karat gold. (All of these, presumably, have different price points.) The Apple Watch device itself will also come in two sizes for different sized-wrists and a range of colors to match the bands. 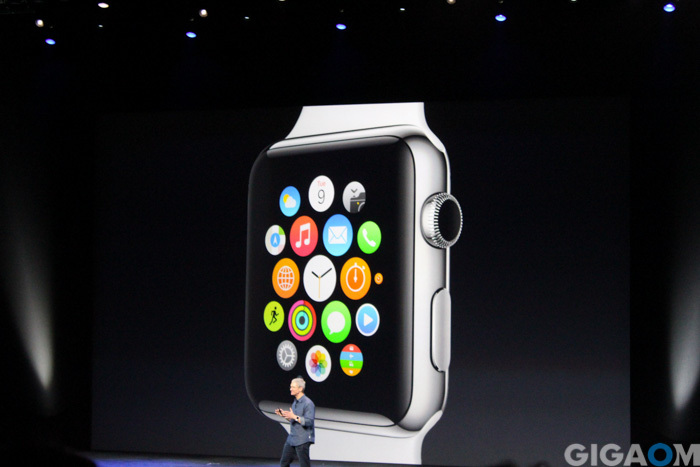 In terms of the user interface, users can choose from different watch faces and rearrange the installed apps. There are a lot of unanswered questions raised by today’s announcement. Apple CEO Tim Cook mentioned additional features, such as controlling your Apple TV, that he didn’t expand on in depth. Apple didn’t touch on battery life — although Cook mentioned charging the device every night — nor the actual size of the watch, which looks a little thick from the videos. And Apple didn’t provide a lot of information about the system on a chip powering the Apple Watch. Its mainly a quality of life change starting with the highly anticipated bump in screen size… If you want a big change.. Def skip the 4.7 and go straight to the 5.5… It has the better screen and the better camera functionality… If all you want the iphone for is to make actual calls- then the 4.7 sized iphone 6 is a safer route… 5.5 is the one that jumps out at me tbh… Can’t wait. So, if the iPhone needs to be present for functionality like GPS (for directions) to work, why am I looking at the screen on the watch? Oh boy, this is horrible ,it’s worse than the best Android watches and the price is beyond stupid.They even failed at presenting it. The form factor is wrong for 2 main reasons. 1. A device like a watch is not the best way to display info or to navigate it.. A watch displays very little info at a glance while a smartband needs to do that but also a lot more. 2. If it looks like a watch you got to compete in design with traditional watches and there are 1 million different watches out there. The design is horrible. Would have been great in the 80’s , they glued an ipod nano to a band, added a screen and rounded the corners. It’s thick and ofc it’s thick if you just layer the cover glass,the screen ,the PCB , the battery and the back cover with sensors. You either shrink the PCB to fit next to the battery or you move at least the battery in the bracelet (and get to use a much bigger one) . You can’t do that you keep working instead of releasing a half cooked device. And the price…. i was saying during the event that they are likely to price the 2 sizes at 129$ and 149$ if not cheaper but apparently they forgot that Apple goes for high margins not crazy margins, someone needs to tech Cook what Apple is. And then they even messed up the presentation, focus on the few core features that sell the device, give them stupid marketing names and don’t get lost in all minor nonsense. They had 4 pillars to focus on – health/fitness, notifications/alerts , remote/home automation and payments. Tim Cook needs to go. And btw , according to Apple, the sizes are 38mm and 42mm, assuming that’s the it means 1.5 inch and 1.65inch. Apparently the size is for height not diagonal. Oh… The envy and jeaLOUSy of the AnDROIDS! Listen, my little robotic friend… The Matrix Has You! Alas, far more than I need. I’d love a $19.99 that monitor movement for sleep apps and vibrate as an alarm or phone ring.